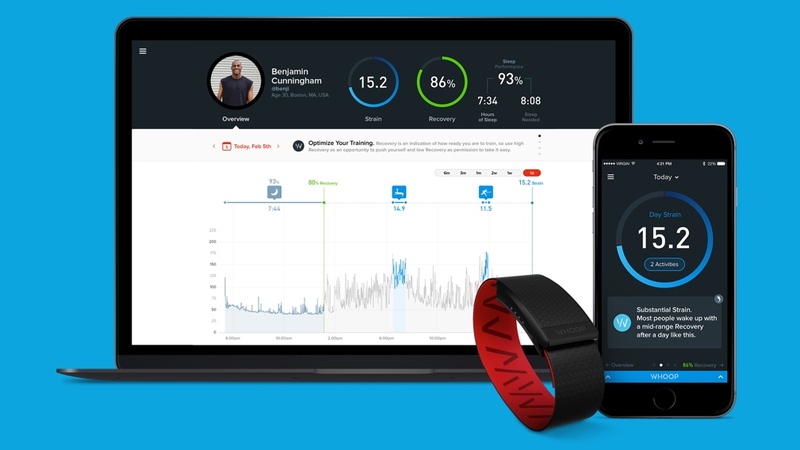 Whoop, the wearable wristband that offers predictive analytics system for athletes and coaches, is available to consumers for the first time. Costing $500, you can pre-order one now for a December delivery. Whoop continuously measures skin conductivity and heart rate variability (more than 100 times a second), as well as monitoring sleep, to analyse how an athlete's body is handling the strain of working out or performing and how it recovers. Its analytics dashboard is focused on the role of sleep and recovery, making sure athletes peak at the right time and avoiding over and under training. The idea is to help prevent injuries and it even considers how travel schedules can affect a player's freshness for their next performance. It's used in training by NFL and NBA teams in the States and also by Premier League footballers here in the UK. However, it's not yet sanctioned for game-time: Matthew Dellavedova, a point guard for the Cleveland Cavaliers, had been wearing Whoop on his wrist before the NBA noticed. He avoided a fine but was banned from strapping it on again. We're told that 20 Olympic athletes, including swimmer Ryan Lochte, wrestler Adeline Gray, and beach volleyball team Casey Patterson and Jake Gibb, are using Whoop in preparation for Rio 2016. "Over my many years on the national team I've learned that training for the Olympics is more than just long hours in the pool and weight room," said five-time Olympic gold medalist and current world record holder, Lochte. "Much of your success in the pool comes from what you do outside of it. WHOOP has given me insight into my sleep and recovery which ultimately helped push my training to new levels." Boston-based Whoop was founded in 2012 by squash player Will Ahmed and two other Harvard graduates who set out to build a wearable tech system "robust enough to prepare a Navy SEAL but with the form factor that the average athlete would feel comfortable wearing 24 hours a day." "After seeing such success with elite athletes, we're very proud to be able to share our performance optimization system with the public," explained Ahmed. "For the first time, every athlete will be able to get actionable data, measure strain and recovery and optimize travel and sleep – all so that they can reduce injury and improve performance." Whoop Strap 2.0 adds full automation, so there is no need to manually enter data. People who pre-order get five coloured bands with their delivery, along with a travel puck and battery pack. Talking battery, you're looking at 36 hours of life before a charge is needed. As we said, it's $500 and you can order direct from Whoop now.